Defensive lineman Sam Kamp chatted with FishDuck.com writer Tyler Robinson at the Hatfield-Dowlin Complex today. The injuries to the Ducks’ offensive line have been in the news plenty this season, but the Ducks have dealt with injuries on the defensive side of the ball as well. A mainstay for the Ducks defense, Arik Armstead has battled an ankle injury this season that has caused him to miss games. 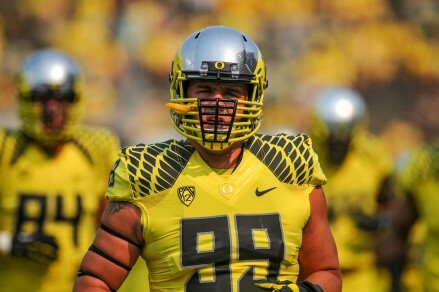 So who are the Ducks to call on to replace the star defensive lineman? That would be redshirt junior Kamp who put on 30 lbs. over the offseason so that he could play in the middle or on the end of the line. Sam Kamp has stepped up this year for the Ducks. Kamp has seen more playing time this season than in past years, and he says it is because he has played more consistently. “[It’s about] being focused on not what everybody else is doing, but what you’re doing to get better,” he said. Kamp has played well this season, filling in for the injured guys, and he has gladly embraced that role. He recognizes the talent the Ducks have in players such as Armstead and DeForest Buckner. “[They’re] amazing, physically dominant players, and I’m ready to play when they go down or if they need a break,” Kamp said. The Ducks will have a challenge with another strong, physical offensive line this weekend and a running back Kamp said is “the best we’ve gone against” in Devontae Booker. the 5’11, 203 lb. back will try to run in between the tackles, but the defense is ready for him. “The plan is to run at them harder,” Kamp explained. The Ducks also have plenty of momentum coming off a dominant performance last weekend to beat Stanford the first time in the last three years. Look for Kamp and the rest of the Ducks’ defense to continue the dominance this Saturday in Salt Lake City.